Joan Burton was responding to criticism over a major backlog in processing applications for the back-to-school clothing and footwear allowance. 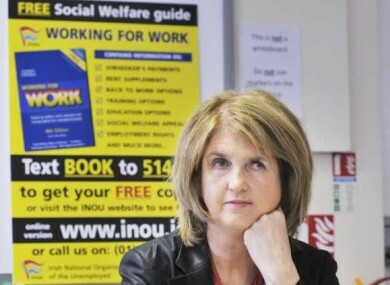 THE MINISTER FOR Social Protection, Joan Burton, has defended the way her department has handled the backlog of back-to-school clothing and footwear allowance claims despite figures showing some families could be waiting until October to receive money. As revealed by TheJournal.ie last week, the Department of Social Protection has been inundated with applications from tens of thousands of families meaning that claims from mid-July were still being dealt with as of last Wednesday, just as the school year gets underway this week. It is currently understood that claims that were received by the department on 14 July for social welfare recipients and 13 July for all others are currently being processed. Burton defended her department’s progress on the applications, saying that by the end of June, it had paid 127,000 families a back-to-school clothing and footwear allowance. This pay out was based on those families having qualified previously and having already met the criteria for this school year to receive the allowance. She went on to explain that 30,000 of the additional 70,000 applications that have been received have been paid out “as we speak” and said that the department was receiving 3,000 applications per day in July. Parents qualifying for the allowance are entitled to receive €200 for children aged 11 and under, and €305 for children between 12 and 22, to cover the costs of clothing their children for school. The budget for the payment was increased by €4.6 million this year to over €80 million. The Minister said that time was needed to check applications and reiterated her stance that the department had done a good job: ”We do though, have to check that the people applying for the back-to-school clothing and footwear allowance are entitled to the allowance. “Families with children going back to school face very significant bills and costs but my department has actually, at this point in time, provided assistance to 300,000 children in this country. “There are about 1.2 million children in the country getting child benefit, we have already given assistance to 300,000 children,” she added. Meanwhile, the Minister for Education Ruairí Quinn has today announced that he is seeking to implement measures that would see school textbook publishers reduce the cost of books for parents from next year. As nearly 850,000 students at primary and secondary level return to school today, the Minister wants publishers to do more to help reduce the price of textbooks. He wants the cover price of the most popular books to be reduced, schools who buy in bulk to be offered a discount, textbooks to be sold separately from workbooks so as they can be reused and support materials for teachers to be made available online. “I am planning further meetings with education book publishers to progress this issue in the autumn. I hope that my proposals and these meetings will be of significant assistance to parents with back to school costs for the next school year,” he said today. Email “Minister defends back-to-school allowance backlog ”. Feedback on “Minister defends back-to-school allowance backlog ”.